Messing up a classic dashboard with a standard aftermarket radio would be a shame, so it's a good thing classic car radio replacements exist. Classic cars aren’t ever going to be as safe, or as efficient, as their modern counterparts. There are certain safety features, like seat belts, that you can install yourself without too much trouble, but for the most part, driving a classic means fewer of the little conveniences and innovations that we take for granted. You’re probably never going to graft anti-lock brakes onto your Chevy Bel Air, and even retrofitting things like air conditioning or power steering can be a bear, but the biggest sticking point for a lot of people is the inherent difficulty in replacing a classic car radio. Even if you’re lucky enough to have a classic car radio that still works the same as it did the day it rolled off the factory line, your entertainment options are going to be strictly limited. The first AM/FM car radio didn’t even show up until the 1950s, and cars and trucks with AM-only radios were still available into the 1980s. Car stereos weren’t technically even a thing until the 1960s when the first car audio systems with separate left and right channels started showing up. The trouble is that aftermarket car radios largely conform to the DIN standard these days, and cars built prior to the 1980s tended to use radios that were a pretty mixed bag in terms of size and shape. So while upgrading the head unit in a car that was built in the last 20 or 30 years is usually a pretty simple affair, a classic car radio replacement can be a much stickier issue. Whether you’re stuck with an eight-track player, cassette deck, or a classic car radio that is literally just a car radio, some of the more modern portable media formats can look mighty attractive, even if you’re adamant on hanging onto your classic. If you do want to listen to CDs, MP3s, or even Internet Radio in your classic car, or even widen your horizons just enough to make the jump from AM-only to an AM/FM radio, there are a few ways to go about it, and most of them don’t even require you to ditch the OEM look of your classic dash. 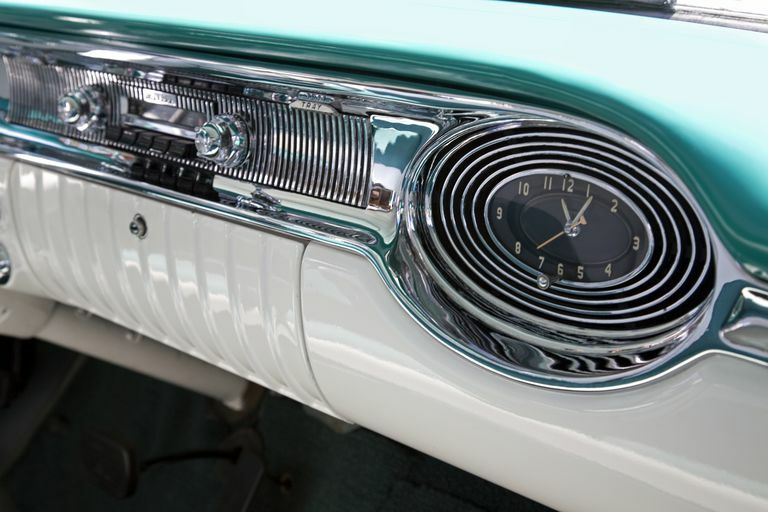 The main issue that you’ll run into is that most classic car radios, and the dashes they were designed to work with, don’t play nice with the modern DIN standard. A lot of classic car radios are highly integrated into the dash, and even the more modular models typically used a “shaft style” radio that you don’t see a lot today. In the case of cars designed for a “shaft style” radio, the dash will typically have two holes for the shafts, and a small rectangular hole in the middle, and good luck fitting in a DIN head unit without cutting into the dash. In some cases, it actually is possible to replace a classic car radio with a standard DIN aftermarket head unit. This is usually accomplished by mounting the new stereo under the dash, which has both advantages and disadvantages. The main reason to mount a modern DIN head unit under the dash of a classic car is that it allows you to take advantages of all the options available from new car radios today without cutting into the dash. The trade-off is that mounting a head unit under the dash of your classic car usually isn’t going to look that great, and it may even get in the way. If you mount it far enough under the dash that it isn’t an eyesore, and your passengers won’t bang their knees on it, then actually operating it while you’re driving can also be an issue. In terms of wiring a modern DIN head unit into a classic car, your experience will depend largely on the vehicle you’re dealing with. You should be able to use the same power, ground and antenna connections, and you may also be able to use the same speaker wiring. The main issue is that if your car shipped from the factory with a mono car radio, you’ll have to run new speaker wires. And if it shipped with fewer than four speakers, you could end up having trouble figuring out where to put your new speakers at all. If you aren’t too excited about grafting a modern DIN head unit under your dash or cutting into the dash to make room, there are two options that you can explore. The first option, which will work with literally any make, model and year combination you can think of, is to go with a hideaway car stereo. Since hideaway car stereos are literally designed to be “hidden away” in your glove compartment, under the dash, under a seat, or anywhere else you like, there are no compatibility issues to worry about. In a typical scenario, you would leave your old car radio in place for aesthetic purposes, but the hidden unit would be hooked up to power, antenna, and speakers instead. Hideaway car stereos are often controlled by a portable remote control unit, which is a little less convenient than just twirling the knobs on your dash like you’re used to. Some can also be controlled by a smartphone or tablet. In either case, for the sake of convenience, a dash mount can provide easy access to your control method of choice. The other option is to use a semi-universal classic car radio replacement and a faceplate kit appropriate to your specific vehicle. These units typically follow the “shaft style” design aesthetic, and the actual shafts are often adjustable on a horizontal axis to fit a variety of different classic cars. Due to the size limitations involved with a direct classic car radio replacement, these units are typically mechless. That means you won’t usually find a direct replacement for your classic car radio that is capable of playing CDs right out of the box. However, they often include features like RCA or 3.5mm audio inputs, USB ports, and even SD card slots, which open up a whole lot of different options for listening to music and other audio content in your classic car. If your classic car came with a “shaft style” radio, with two holes for the shafts and a rectangular hole in the middle, then you’ll probably be able to find a modern replacement. If you’re looking for a catch, the price tag may end up a little less than appealing when compared to bargain bin single DIN head units, but the trade-off is that you should be able to achieve a close-to-OEM look. This is achieved through the use of knob and faceplate kits that are available in a wide variety of designs. This allows you to identify a set of knobs and a faceplate that closely match the rest of your dash and pair them with a head unit that has a lot more going for it than staticky AM radio. The other option is to find a replacement radio that is specifically designed for the make, model and year of your vehicle. For more popular models, this is a totally viable option. For less common classics, you’re going to be better off going with a unit that accepts customizable faceplates and knobs. The primary motivation behind replacing a classic car radio may just be to move beyond AM radio, but modern replacements can offer a whole lot more. In addition to multiple audio sources, like listening music from a USB stick, or plugging an MP3 player in via an aux input, you may also be able to take advantage of features like Bluetooth hands-free calling, wirelessly stream audio files or Internet radio, or even direct iPod control.